It’s that time of the year again, looking back and looking forward, making plans. Considering that I haven’t touched my sewing machines for more than 2 weeks now and have been sewing irregularly in the past year, I have completed more items than I thought: 31 projects finished. Not a lot, and quite a few of those projects were easy tops, but still a number. 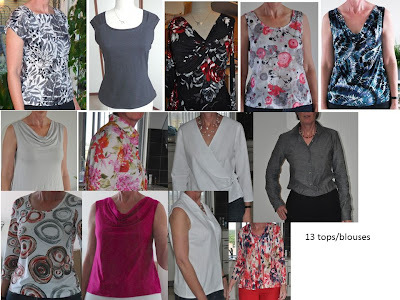 The tops: most of them are liked and worn, with the exception of the blouse with the flowers and the white wrap top. The flowers are not “me”, and I should learn to buy fabric not too impulsively. I can’t pin down what is wrong with the wrap top, perhaps I should take it out again when spring comes and I will like it better? 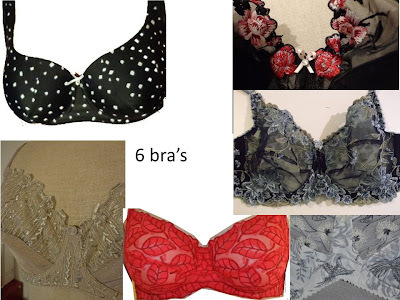 The bra’s, mostly tnt patterns that I can make up in an evening. The exception is the MakeBra pattern I recently tried. That I will try again and make a few little changes for my comfort. Only 2 jackets. The first one I’ve worn very, very much. The second I finished in fall, while I think the colors suit a different season better. Consequently I have not worn it a lot yet. Dresses: even 4 of them. I’ve changed quite a bit. 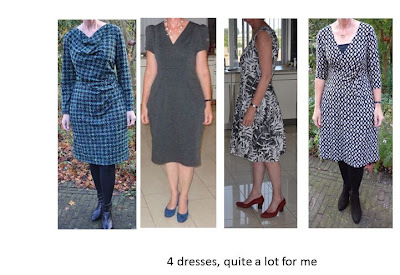 I also bought 2 rtw dresses and wear a dress quite regularly now. 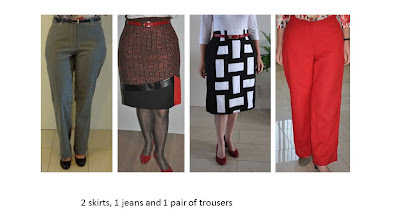 This change is reflected in the number of trousers I made: only 1! By now I feel a shortage of them in my wardrobe. I’ve thrown out a few that I found too wide, and now I miss a few basic winter ones. Must work on that. To finish the list I made 2 quite distinctive skirts. I like them but haven’t worn them. Perhaps I should stick to a solid color or make a combination to wear. Now they are more or less orphans in my closet. Well, that’s my 2012 summary. Of course I have a few things planned for sewing. No fixed list though. In the next week or so I want to go through the fabric collections and make a plan for a wardrobe collection of some sort. I’m thinking of doing the “one pattern, many looks” contest on Pattern Review which starts January 1. I’ll keep you posted in the next year on my sewing adventures. Here’s to a wonderful 2013, let it sparkle and may all your wishes come true! What a beautiful collection of your work! The great thing about creating sewing masterpieces is that you get to wear them too! Thank you Sigrid for all that you do post and sew! I love your blog and have learned so much from you. I also love all these end of year posts. It's so reflective! Gelukkig Nieuwjaar!! I also love these year end posts. It's amazing how much you have sewn! It's fun seeing these new year posts. Thank you for sharing what you make. Happy New Year! Happy New Year - may 2013 be the best year so far! great seeing all your sewing put together - all beautiful. Happy New Year look forward to seeing you soon. I love these year-reviews. You have made beautiful pieces in 2012. Ik wens jou en je familie een goed uiteinde en een heel mooi 2013! This is so nice.Everything fit you beautifully. Have a Happy New Year! Nice collection. Doing a tally helps show you what to do next, even if it's similar clothes as the previous year. Enjoy 2013. Happy New Year to you Sigrid. I am rely impressed by your lingerie. Great year-end review -- you made a lot of beautiful pieces in 2012. I've always admired your jackets and precise tailoring and look forward to seeing more of your exquisite work in 2013. Happy new year! This is a nice year end review. You have some beautiful pieces here, even if you feel that they might not be "you." I certainly know where you are coming from... when I look back at what I've sewed in 2012 there were a few pieces of pretty fabric that drew me in but don't fit into my wardrobe either. Still, it's fun to sew, and I guess that's why we do it! As Meli88a said, you definitely have some beautiful pieces. Your creations are impeccably made and are always an inspiration. Happy new year to you and yours! Wow, you really sewed a lot this year. I loved your jackets and dresses. I really should sew more tops like you do. Happy new year! Happy New Year, Sigrid. It was fun and inspiring to see your retrospective. I love both jackets and may have to try a version this year.